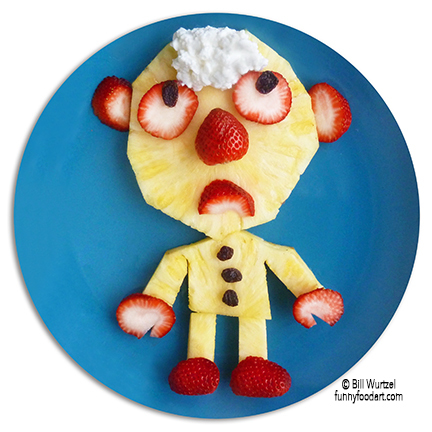 Creating amusing food art with healthy food eposes children to nutritious food and may enhance children’s attention skills while having fun. Bill not only creates imaginative food art, he’s also a renowned jazz guitarist. When our granddaughter Daniela has dinner with us and Bill might make a mischievous character with his food. Daniela laughs hysterically when Bill develops a hilarious narrative for the character. These are very special moments for the two of them. I used to work with children (ages 5-11) who had difficulty with verbal language. It was hard for them to understand what was said to them and even harder for them to make themselves understood. None of them were able to read or write. Getting kids to try new healthy foods can be tough. When Bill and I do Funny Food workshops (using only nutritious food) when kids make a healthy snack they are willing to eat it and they try foods they never tasted before. Playing with healthy (funny) food is a joyful way to develop and practice executive function skills that are essential for daily life. Students may not explicitly be taught executive function skills, and they are important life skills. When I observed my husband Bill make whimsical and healthy food with our granddaughter (at 5-years old), it was a powerful reminder of the importance of having fun while learning. Small changes in the way you eat will result in big differences over time. Slow and steady not only wins the race, but it is the best way to assure success.